We were flying over yellow-orange patterns of lights, graceful traceries that looked like the pathways between star clusters, a spinning galactic dance, momentarily caught and held. Seeing the lights of towns and villages far below, in the night, gives me this deep sense of connection with the human race, as if I need to be separated from it, to feel a part of it. A thin and solid line of lights, like a line of marker buoys, and then nothing. The lights vanished and there was just darkness below. I thought of all that water underneath us but it felt peaceful, almost reassuring. I did not know exactly what part of the coastline we had left behind – it could have been anywhere from Perpignan to Beziers to Sete, somewhere off the south-west coast of France, but I thought of St Exupery, who took his last flight from somewhere off the south coast and was never seen again. Perhaps it was further east he took off from, I could not remember exactly, but that did not matter, I thought of him and that was enough for his presence to be with me. Spirits are no doubt just as itinerant as those of us who inhabit physical bodies, but it felt to me, that if the spirit of St Exupery has any favourite place on earth to inhabit, it would be here, where the undulating blue of the Mediterranean meets the coast of this country, his homeland, an area which, once you go inland from the populated coastal strip, is still wild, unsubjugated, unpredictable. Yes, his spirit would feel at home there, as it would high up above the land, which is probably where he spent his last conscious moments before his plane was shot down. The feeling of his presence accompanying me as the plane turned and headed back to the coast, crossing the thin string of lights, solid as a finishing line, was so strong, it brought tears to my eyes. When I stepped out of the plane at Montpellier airport and drew my first breath of the warm damp air, it was like meeting something I had been separated from for a long time; I felt I had come home. This feeling increased, during the month I spent at St Mathieu-de-Treviers. I cried often – I laughed often too. I spent the first few days exploring my new surroundings. After that, I moved into a rhythm of writing, alternating with bikerides and siestas. One of the great gifts of such a place and time is to be freed from all the things that would usually claim your attention – and all writers know how time-absorbing these other things can be – whether its children, a job, domestic activities, or even the other aspects of writing, such as typing up, letters to editors, research of outlets etc, not to mention having a social life. From the moment I stepped off the plane and inhaled the air, to when I was driven to the train station on the day of my departure, I felt enormous gratitude for the opportunity. Jacques Gaunord met me at the airport and drove me to Maison d’Emma, Residence d’Artistes, in St. Mathieu. He showed me round the house, on two storeys, showed me how the lights and locks worked, where and when to put out the rubbish, gestured with his hand – c’est a vous – he said, and left. The air was doux – soft and warm. The sound of frogs came from a nearby stream. This sound began at dusk and was an accompaniment to the darkness. It was companionable and for me, deeply evocative of another time and another country that I loved. The hot weather came about three days after I arrived. Temperatures soared to the upper 30s. Before this happened, I climbed the smaller of the two ‘pics’ which rose just behind the village. The larger one. Pic St Loup, dominates the surrounding countryside. One side of it is sheer, yellow-grey rock-face. The other is a slope, covered with dark green, looking deceptively innocent and inviting. The smaller one, with the ruins of Chateau Montferrand at the top, took a morning to climb. A few meters beyond the castle wall, the earth vanishes and there’s a sheer drop into the valley below. Pic St Loup, I thought I’d leave for another day – there was plenty of time. But that day never came for me, for it became much too hot to spend a whole day climbing. Almost every morning I would sit outside, beneath the veranda, covered with trailing green vines. And write. As well as the spirit of St Exupery, I was accompanied by the diverse energies of nature – frogs, cicadas, butterflies, lizards, swifts, various other birds and insects. The place had the bliss of solitude, yet was teeming with fascinating life. Next door’s dog became a frequent visitor, flopping down inside the house, on the cool white tiles. The thermometer inside crept up through the 20s, then 30s. In the evenings, cycling along the road leading out of the village towards Assas, the sprinklers in the fields rotated, watering sunflowers, corn and vines. When the sun went down, it would catch the water spray and turn it into gold. The dry earth and corn stubble smelled of heat, like freshly ironed linen. It rained once – for about ten minutes, during a magnificent storm where the thunder crunched and ripped the sky and the lightning’s cold electric light flashed on and off. But that brief rainfall expanded the frog-river to about twice its size, shifted its colour from green to bluey-turquoise and seemed to encourage the birth of enormous dragonflies, with wings of blue, green and translucent white. Which no doubt made the frogs happy. So vocal during the night, they were hard to spot during the day, but with patience, I succeeded – I saw one large emerald-green one and a few smaller brownish-green ones, blending into the colours of the reeds and rushes growing on the banks. All the life-forms of nature were my guides and guardians during that time. The house itself was an utterly benevolent presence. And I learned to slow down, relax and live in the unbelievable abundance of the present moment and be receptive to its unfailing generosity. Maison d’Emma, St Mathieu-de-Treviers, 20 kms north of Montpellier is a residence d’artistes. The residencies are organised by ‘Les Vendemiaires’, a group of local artists. It welcomes artists from all over the world, and although the majority of these are ‘plasticiens’ – visual artists – writers are not excluded, although some knowledge of French is necessary, in order to apply and comply with the conditions. Information can be had from Jacques Gaunord, President, ‘Les Vendemiaires’, 55 cami de las Oliveidas, 34270 St. Mathieu de Treviers, France. Morelle Smith is a poet and novelist. 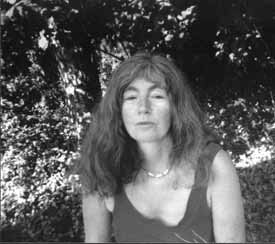 Her poetry collection Deepwater Terminal was published by diehard. An obsessive traveller, she is writing a book about her experiences in Albania. Her recently published ebook, Time Loop, is a novel about the Cathars of south-west France in the thirteenth century, with a spot of slippage into the present. You can find it at NoSpine.com.